Addendum, added on Friday 15th May 2009. Re: Benjamin Kurzweil's version. "Shortly after listening to Cher's work, I happened to receive a CD from Danish voice talent Benjamin Kurzweil narrating his literal interpretation from the Danish manuscript of The Ugly Duckling and was able to gain more insight into Andersen's tale. I found Benjamin Kurzweil's version of The Ugly Duckling very enchanting. Possibly this is because of his accent and also the depth of his voice and how Benjamin chose to colour the words. Another aspect that was evident to me was how well Benjamin had researched this story and how intimately familiar with it he was." Printed in The JC Friday 17th July 2009. "Children love to be read a fairy tale. And most adults love to read them to the kids. But when you have lost your voice, or inclination, there is Benjamin Kurzweil. His CD, Kurzweil Stories, features the Danish storyteller interspersing his own tales with those of his more famous compatriot, Hans Christian Anderson. Kurzweil comes off surprisingly well in the comparison but they may not appeal to very young children." Not having children of my own, and being classed as a �grown up�, it�s been rather a long time since I�ve listened to anyone read a fairy tale, but I must admit I rather enjoyed the experience. My favourite tale as a child was �The Princess and the Pea� and Benjamin�s translation was delightful to listen to. I was soon curled up on the sofa indulging in the joy of being read to, and found his style very relaxing. His voice has a rich velvety quality that transports you into the story, and his accent added to the authenticity of the tales. I was intrigued to listen to one of Benjamin�s own stories and choose �The Apple does not fall far�. I felt the story was in keeping with Andersen�s, and it is clear the influence that Andersen�s stories have had on Benjamin�s own storytelling technique. 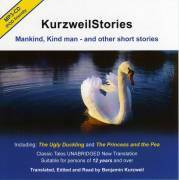 Mankind, Kind man � and other short stories read by Benjamin Kurzweil is a collection of the authors own stories and some of Hans Christian Andersen�s most memorable tales. The Ugly Duckling, The Princess and the Pea, The Butterfly and Luck Can Lie in a Stick are childhood classics that speak of choices to be made, the importance of character and difference. They take on a special tone when read by Kurzweil in his deep accented English, a tone that is slow and self-conscious but also fantastical and rich. Hearing the stories as an adult I realised the adult undertones that so often remain incognito when read as a child. Themes of attraction, marriage, and superficiality run through the stories adding a sophistication that may benefit older listeners. Kurzweil�s own stories are faithful to the style of his compatriot, Andersen. A Chinese Light is a story that speaks of the power of inner strength and the importance of personal character: �Warmth doesn�t come from outside, but from within.� He uses traditional fairytale motifs: �Once upon a time�, personification, simple moral conundrums and standard fairy tale imagery (candles, light, �Oriental� characters), to create little vignettes that fulfil certain expectations. The Apple Does Not Fall Far is probably the strongest of the shorter stories by Kurzweil. It�s a tale that evokes biblical imagery of apples and gardens and there�s a little cameo by Isaac Newton. Again, the apple is stock fairytale imagery but this helps to place Kurzweil�s own tale in that standardised, formulaic orchard of fairytale tradition. It is Kurzweil�s voice that makes his readings special, as do the languages in which he reads them: English, Danish and Hebrew. Definitely tales for the polyglot. His voice is exactly what one expects and hopes for when listening to this type of material: deep, smooth and a little enchanting. On occasion his voice lacks a certain cadence and struggles with standard pronunciation, but to me this only adds to the experience of listening to fairytales in a foreign and therefore �exotic� accent. I thoroughly enjoyed listening to the CD. This is an accomplished collection of classic and memorable tales. Senior Project Director Naseem Jeewa at Bubbles Translation Services in the UK. Nassem Jeewa has been working 17 years in the translation industry. I am very impressed with Benjamin Kurzweil's translation of Hans Christian Andersen's tales. I was surprised how suitable the stories were for grown-ups as well as for children. Not being a Danish speaker I had never read the original stories and therefore was never aware of this fact. The English version translated by Benjamin Kurzweil was perfect. From a translation point of view, I would never be able to tell that these were translations of Danish masterpieces - this is a golden rule of translations. The golden rule says that a translation has to be done so smoothly that a native speaker, reading the translation, should not notice that he or she is reading a translation. That's why the target language of the translation has to be done by a native speaker, which isn't the case with Benjamin Kurzweil - he is a native Dane. This is why his translation is even more impressive; even though it was done with the help of proof reading and face-to-face language coaching by a native speaker. Well done. Can't wait for the next series of stories.